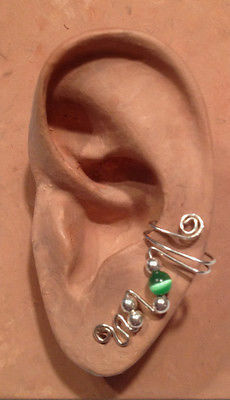 All EAR IVY ear cuffs are made by hand to order. You select which ear, LEFT or RIGHT, you wish to wear it on and what color Cat's Eye bead you would like. Cat's Eye beads are made of a fiber-optic man-made stone that has a shiny "eye" similar to a Tiger's Eye stone. Very beautiful. Simply slide the ear cuff onto your ear. No piercing required or you may dress it up with a diamond stud or dangle earring. Comes gift boxed with instructions. Very unique, wear one and see how many compliments you get! The beads colors are listed in the same order as they are shown in Photo #3. 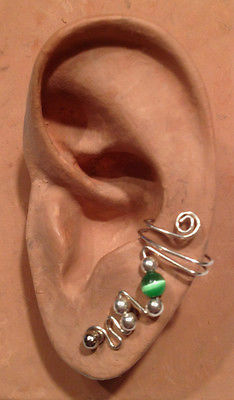 The first picture shows an Ear Ivy Half Cuff with sterling silver wire and beads with kelly green cat's eye bead. The second picture shows an Ear Ivy Half Cuff with sterling silver wire and beads with kelly green cat's eye bead and an earring stud. The earring stud is not included in the purchase price.